This was not what I had planned for my next post. Neither had I expected to write one so soon. Rest in peace, Mr Khanna. You will be missed. After Shammi Kapoor, or perhaps, even more than Shammiji, Rajesh Khanna embodied romance. His crinkly eyes and lopsided smile won hearts and set the box-office on fire, until the mannerisms threatened to overtake the man. I would like to remember him, however, as the actor who made my movie-watching such fun in the early years, when a ‘Rajesh Khanna’ film meant pure entertainment, great songs, beautiful heroines – and Kaka. Above all, Kaka. As Javed Jaffrey stated in Videocon Flashback, there was a time when Kaake ne patang udaai toh film hit! This was not hyperbole. Between 1969 and 1971, fifteen of his films, all solo-hero, were superhits. This is a feat unsurpassed by any hero since. An intense period of hit after superhit followed, marking an epoch in Hindi cinema. Born Jatin Khanna, Rajesh Khanna won a talent contest that ensured his entry into films with Aakhri Khat and Raaz. I was never a Rajesh Khanna fan, having grown up in the era of Amitabh Bachchan, but a Rajesh Khanna film, especially the earlier ones, were always watchable. Underneath all the mannerisms, Kaka was a fine actor, a fact that is sometimes lost while analysing the phenomenon that was Rajesh Khanna. Rajesh Khanna once said, “I always thought of myself as an actor. Somewhere along the way, I became a superstar.’ So, here are the films that to me, encapsulated the actor that was Rajesh Khanna. All solo-hero films that I have seen, some more than once, and enjoyed thoroughly. Films that, even if they did have his trademark gestures, showed us what he was capable of and how much more he could be if he chose to be so. 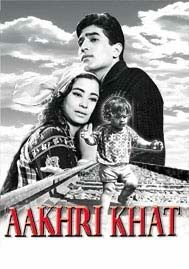 While Raaz was the first film that he signed, it was Chetan Anand’s Aakhri Khat that hit the marquee first, and introduced the man who would go on to become a phenomenon. It was a subdued debut, that of a man with grey shades. Rajesh Khanna is Govind, a youth who meets and has a tryst with a hill maiden, only to leave her behind. When she comes to him in the city, pregnant and helpless, he refuses to accept that the child is his, until circumstances force him to change his mind. Will it be too late? 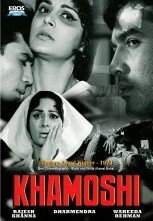 It took a great act of courage for the makers to film in black and white in an era of riotous colour, but somehow, the theme of Khamoshi seemed much starker in simpler shades. Khanna plays Arun, patient no: 24, who is subjected to an innovative ‘treatment’ at the mental hospital. Looked after by a nurse who is fighting her own demons, he not only recovers, but falls in love with her in the process. While the film belongs to Waheeda Rehman, who plays a nurse forced to act a part that is abhorrent to her, Rajesh Khanna provided able foil as the man who is so in love with a woman that he is convinced it is reciprocated. 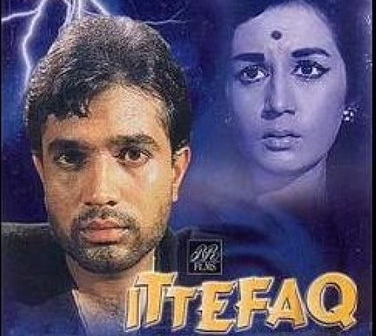 A rare phenomenon in the song-filled sixties, Ittefaq was an experimental song-less film made by BR films, and directed by Yash Chopra (before he became the king of sarson ke kheth). As Dilip, a man accused of his wife’s murder, an eager-to-prove himself Rajesh Khanna rose to spar with Rekha (Nanda in an excellent portrayal), in whose house he hides himself while on the run from the police. An intense psychological thriller that keeps you guessing until the last scene, much depended on the chemistry between the leads, and the atmosphere they create. The seasoned actress and the novice hero rose to the occasion. The film that saw the birth of the ‘Rajesh Khanna phenomenon’ and the resurgence of Kishore Kumar, the singer, as the superstar’s voice, Aradhana saw Rajesh Khanna play his first double role – as Sharmila Tagore’s lover and her pilot son. Mere sapnon ki rani kab aayegi tu crinkled Kaka at a dimpled La Tagore, and overnight, a sensation was born. There is an interesting story about the making of Aradhana. Originally, Rajesh Khanna was to only play the lover. Just before the first day of shooting, Shakti Samanta was invited to a preview of Ek Shriman Ek Shrimati. Shocked to see that the ending of the film was similar to the movie he was going to shoot, Shakti Samanta nearly scrapped the whole thing. 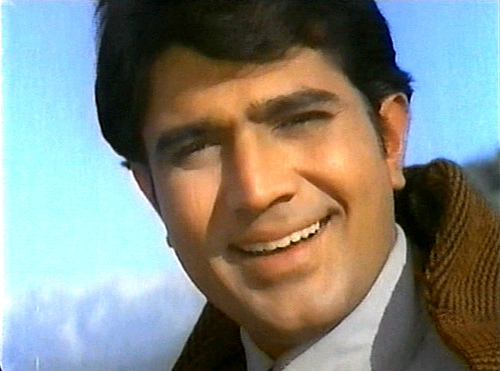 Until writer Gulshan Nanda persuaded him to reconsider, suggesting that both roles be played by Rajesh Khanna. They reworked the ending of Aradhana in a few hours, and as they say, history was made. 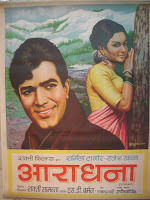 As the cancer-stricken eponymous hero, Rajesh Khanna played Anand with the minimum of melodrama. Hrishikesh Mukherjee’s protagonist never cried; he made the audience shed tears by the gallon. His death speech became iconic; his character laughed at himself just as much as he made others laugh. Anand’s inner anguish is only to be guessed at, as Rajesh Khanna played him with a subtlety that went missing when the ‘superstar’ overtook the ‘actor’. It was one of Rajesh Khanna’s finest performances. Sharmila Tagore once described Amar Prem, her favourite amongst her Shakti Samanta films, as sheer poetry. That it definitely was. Anand (Rajesh Khanna) is an unhappily married man, who is at once cynical and romantic. His pragmatism helps Pushpa (Sharmila Tagore) come to terms with her life, even as Anand becomes (it is suggested) her only client. What was interesting (at least to me) was that Amar Prem depicted an unconventional relationship between a man and woman. Is it necessary to be married to feel an emotional connection to another person? As Anand says Agar koi apna na hokar bhi apna lage to use kya kehte hain? A remake of the Bengali film Nishipadma starring Uttam Kumar, Amar Prem came at the height of Kaka’s and Sharmila Tagore’s careers, and cemented their box-office stature. 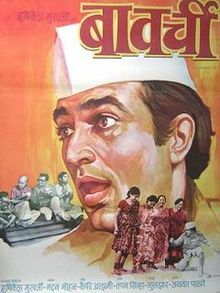 Based on yet another Bengali film (Galpa Holeo Satyi by Tapan Sinha), Bawarchi saw Rajesh Khanna don a chef’s cap as he tries to broker peace in a squabbling joint family headed by the irascible Daduji (Harindranath Chattopadhyay). With unfailing good cheer, Raghu (Rajesh Khanna) takes on every task in the family, and seems to be a poet, musician, storyteller – in other words, too good to be true. Bawarchi was an unpretentious film, heart-warming without being too-sweet-to-swallow, and under Hrishikesh Mukherjee’s firm handling, Rajesh acts out the part with seeming ease. Hrishikesh Mukherjee’s adaptation of Becket pitted Rajesh Khanna against the man who would prove to be his nemesis – Amitabh Bachchan. A film about the clash of opposing ideologies, it was also a rendering of the relationship between the two protagonists. Rajesh Khanna played Somu, conflicted by the choices he has to make – on one side is his friend, closer than brother; on the other is his conscience which questions the rightness of what he is doing. At the trial of the film, Rajesh Khanna turned to Hrishida and said ruefully "Here is tomorrow's superstar." In Basu Bhattacharya’s hard-hitting examination of man-woman relationships (part of his Amar-Mansi trilogy, the other two being Anubhav and Grihapravesh), Rajesh Khanna teamed up with one of his favourite heroines – Sharmila Tagore – to play Amar, part of the disillusioned married couple. It was a far cry from Mere sapno ki rani as the couple savage each other as their relationship lies in ruins around them. Avishkar was a revelation as the leads left their baggage behind (his mannerisms, her trademark bouffant and false eyelashes) as they play a couple struggling to save their marriage. It won Rajesh Khanna a well-deserved Filmfare award for Best Actor. A remake of the Malayalam hit Vaazhve Maayam, Aap ki Kasam saw a stunning performance from Kaka as the suspicious husband. Ably complemented by Mumtaz as Sunita, the anguished wife, and Sanjeev Kumar as Mohan, the unfairly-accused friend, Rajesh Khanna brought subtle nuances to a character that could have unredeemably black. It is one of Rajesh Khanna’s ‘unconventional’ choices as hero; a character with grey shades, and with the audience sympathy going firmly to the other two. 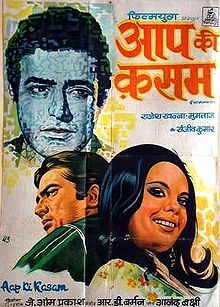 With great songs, and wonderful chemistry with other Khanna-favourite Mumtaz, Aap ki Kasam took a closer look at how unfounded suspicion can sound the deathknell of a relationship. Thus ends an era. It’s been a sad year for people like me who grew up with these actors as our reference points for films. Rajesh Khanna will live on in our memories, in the Kishore Kumar songs that he ‘sang’ on-screen, in his films. Somewhere up there, in the happy hunting grounds of actors, Kaka phir patang uda raha hoga. Oh Anu... I simply burst into tears in front of everyone when I learned about his death... oh my God... just... oh my God. This is horrible. Why? My major crush when I was in college - Rajesh Khanna! We went and saw Aradhana, and later two of my friends went and bought the LPs of that movie, and then we occupied the common room daily to listen to the songs. What is important here is that this listening took place during the study holidays, so the question is, how much studying was being done during that time? The answer is, very little! But it was worth it! This is impossible to believe - that all my heroes from my younger days should be passing away like this, one after the other - Shammi Kapoor, then Dev Anand, Dara Singh, and now Rajesh Khanna! My Dad used to enjoy Aradhana, and my mother had even taped the movie. Needless to say, that was one of the first DVDs I bought, and one of the first cassettes I bought when I came to this country, and my sons know those songs inside out, thanks to a cross-country trip in '88. Rest in peace, Kaka! You will be sorely missed. I forgot to add - that was a lovely tribute to Kaka! Thanks, Anu! So were you and your friends one of the many girls who wrote letters in blood to him? *Grin* I can understand the hysteria he evoked, even though I had 'fallen hard' for his arch-nemesis. I remember seeing his older films on Doordarshan and thinking that he truly was a very handsome, very charming man. There was something about the way he smiled that tugged at your heartstrings. This past year has been particularly bad, hasn't it? Shammi, Dev, Nalni Jaywant, Ravi, Joy Mukherjee, Dara Singh, Jagjit Singh.... and now, Kaka. A beautiful article, which is all the more creditworthy because you couldn't have had the time to polish it at leisure. I was a student when Rajesh announced himself with Aradhana. That was my first year in Hostel, away from parental discipline, and there was hardly any movie during 1969-71 that I missed. There is not much I have to say about the films you have covered, except to nod in agreement. One, comparatively less known film I recall is Bandhan(1969). It was a simple film in a rural setting, with hardly a story. The role suited Rajesh's evolving screen persona perfectly. Comparison between Rajesh and Amitabh is inevitable. I've gone through the list of films on Wikipedia by both and the difference in their career trajectory is stark. From Aradhana to Bawarchi Rajesh did some twenty-odd films and all but three or four of them were hits. Then there was a sharp decline, relieved somewhat by a bunch near Daag and Aap ki Kasam, and another smaller peak near Mehbooba. After that it was all downhill. Amitabh started slow, and never achieved the kind of blistering success Rajesh did at his peak. But he proved to be a marathon runner - delivering a hit or two every year along with several failures - and made a transition to mature roles after his comeback from oblivion in 98. I don't think there will be another one like him, primarily because Cinema has changed, and there is no room now for the kind of characters he played. I just can't imagine a modern Rajesh Khanna with a Khan-esque physique and mannerism! Thank you, Subodh. Indeed, I did write it off the cuff soon after I read about his demise in my feeds. I agree with your summation of the two actors. In fact, Amitabh himself said that there was only one true superstar; that he had never scaled the heights like Rajesh Khanna did at the height of his popularity. An era has truly ended, no? What a beautifully-written post, Anu - and such a good listing of some of Rajesh Khanna's best films. As I read through, I found myself nodding 'yes' to so much of what you'd written. About Anand, for instance, or Aradhana, or Ittefaq (all of them favourites of mine). Besides the fact that he was drop-dead gorgeous, I like the fact that Rajesh Khanna did a fair number of unconventional roles... stuff a lot of other stars wouldn't have touched with a barge pole. Another Kaka film that I like quite a bit is Dushman. The end's OTT, of course, but it's an unusual film in some ways. Indeed, a very befitting tribute to the inherent ‘actor’ within the outwardly effervescent persona of a 'superstar'. If Anand provided a platform to establish Rajesh Khanna also an actor of merit, Khamoshi was an apt validation. In Anand he picked up the role when he was at full height of his ‘glamor’ image career, Khamoshi was even more daring choice, because here his character was to play second fiddle to the female lead, both in terms of characterisation, and hence, the spectator sympathy. But he did such roles with as much élan as his otherwise successful, more commercial roles. Incidentally, his meteoric rise of popularity ‘glamour’ roles also coincided with equally stunning rise of R D Burman and Kishore Kumar. All three had been there for some time, had lots of talent, but required Midas touch of Lady Luck, ‘Aradhana’. That validates his statement that he was an actor first. If he would have ensured that actor in him would have maintained dominance over his flamboyant image, he would certainly have carved out a much more respected image, like Sanjeev Kumar did. Nonetheless, Rajesh Khanna certainly deserves to be remembered as a n Actor, I respective of his short or moderately long career as The Superstar or glamorous character. Thank you, Madhu. He was drop-dead gorgeous, wasn't he?! One thing I liked about most of his films those days was that, like Shammi Kapoor's, they were all totally entertaining, and they all had good songs. Thank you, Ashokji. Rajesh Khanna was certainly an actor first. I think, in his case, the long string of hits made him over-confident, and he had a whole bunch of yes-men who were willing to bask in his glory and pay obeisance to him. It went to his head. By the time he realised that he had alienated the very people who had once helped him be the 'star' he was, it was too late. I was quite surprised the other day while watching Dushman. I didn't know that he had done a movie with the legendary Meena Kumari. There are very few people today who have a proper insight into her life and perhaps he was one of them. Arjun, his fall was his own fault really. He made too many enemies when he was at the height of his stardom. Coupled with the fact that everyone loves to pull down people who are at the top, and you had the classic set-up for a debacle. Coming to Devyani Choubal, if she made that claim, she was silly. Rajesh Khanna would have been a phenomenon, with or without her writing about him. The stars don't need the media as much as the media needs the stars. A fact that Amitabh Bachchan proved quite comprehensively. During the period when film magazines banned him, and would not mention either him or his movies, he gave some of his career's biggest hits. Eventually, they were forced to accept that he was bigger than they were. I didn't write letters in blood, but I would definitely have welcomed someone who serenaded me the way he did in the song, Mere sapnon ki rani ... or Yeh shaam mastaani ...! And yes, I did buy the issue of Screen with his wedding pictures and devoured every single line of it! I also resented AB for stealing the limelight and for bringing all the anger to the screen, and taking away the soft romance. Romantic me, huh? And I did not save that issue, in case Ms. Bombaynoir thinks I still have it! The word Superstar was coined specially for him.That was the level of success he achieved .Nobody before him had generated such a mass hysteria.Leaving Dilip Kumar,Raj Kapoor,Dev Anand,Shammi Kapoor,Rajinder Kumar etc way behind he achieved meteoric success. We have grown up watching his movies and aping his mannerisms.I remember in school my classmates would often ask me to sing "Mere Sapno Ki Raani ..." ,or "Pyaar Deewana Hota Hai...".Unforgettable times !! Till date romance and quality music is associated with his films. Later however he faded in oblivion and had personal problems too.But his legacy will live forever.His era is so nostalgic and a part of our personality too. We wiill miss you Kaka...And i say this with tears in my eyes. Also he never reinvented himself like Dilip Kumar or Amitabh Bachchan.Thus he faded into obscurity faster too. Ha ha ha! I'm glad you gave that warning! You are so right, Aasheesh. His legacy will love forever! His arrogance did come in the way of his success, and by the time he turned over a new leaf, there were no takers for his brand of films. Action films did not suit him. It was said to see that happen to a star of his stature. I wish he had remained the actor he was, instead of buying into all the trappings of stardom. I started to write a tribute but reading yours & Dustedoff's excellent pieces, decided to comment instead. As I mentioned over in Dustedoff's, I started with Rajesh & ended up with Amitabh. After reading several tributes, there is not much I can add, except to say that Rajesh was the Last Great Songs Hero. As an exercise try building a list of top 10-15 songs from films that were NOT HITS, for both Rajesh & Amitabh. Rajesh's camp --- songs from Akhri Khat, Raaz, Dil Daulat Duniya, Joroo Ka Ghulam, Mere Jeevan Saathi, Raja Rani, Humshakal, Ajnabee, Mehbooba, Prem Kahani, Kudrat & Rajput. Songs from Rajesh's second tier movies not only outshine (or at least equal) Amitabh's second tier movies, they challenge his top tier as well. When it comes to music Rajesh Khanna's movies are way ahead of Amitabh.Do Raaste,Aradhana ,Kati Patang,Mehboob Ki Mehndi,Aap Ki Kasam,Kudrat,Roti,Sachcha Jhoota,Maryada,Amar Prem,Anand ,Aan Milo Sajna,Chaila Babu,Daag,Souten etc are prime examples of the quality of music in his films.In fact music to a large extent contributed to his popularity.Amitabh's movies did not have music that would stand the test of time.It had a temporary feel to it,and looked visually good till the scene lasted.Nothing permanent. Also if you see overall the ratio of super hits of both Amitabh and Rajesh Khanna is almost equal.In Amitabh's case he prolonged his career,but Rajesh Khanna just came crashing down never to recover.In retrospect there is not much difference in their percentage of success. As I mentioned at DO's blog, the discussions of his films has revealed that Rajesh KHanna did act in quite a few good films, and you have listed them all out. Each and every film there was a good one with Rajesh showing his acting prowess. *sigh* It's all so overwhelming. I would say that since Amitabh's movies did not usually revolve around romance, there was less scope for songs. I mean, AB's movies were more action-oriented, and had much less scope for singing songs with the heroine. Sometimes, even when he had a heroine (Kala Patthar, Deewar, etc.) he didn't sing songs with them. His 'romance' was more muted. It is overwhelming, pacifist. You know, if you had asked me before, I would have staunchly denied being a fan of Rajesh Khanna. I'm just now realising how much I enjoyed his films, and how varied they were, in terms of his roles. An excellent tribute. I do not want to repeat my comments on dustedoff. You have included almost all his films which are my big favourites. I remember very clearly I liked Hathi Mere Sathi a lot, which is missing here. There was something very charming about the film, full of humour, emotion and good songs. In Anand, Amitabh Bachchan too left an indelible imprint. 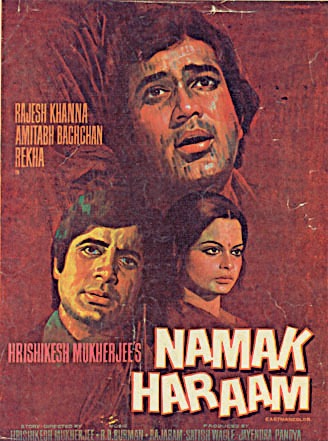 Namak Haram to me was more of his movie than Rajesh Khanna's. When RK was dethroned by AB, the fall was complete and unambiguous. I feel I cannot dispute the selection of films in your write-up on Rajesh Khanna; they perfectly represent the filmography critically and popularity-wise. Thanks, AK (AU? AM?). :) I haven't rewatched Haathi Mere Saathi for ages! I last saw it when I was 7 or 8, which is why I didn't include it here. Besides, I had others that begged for inclusion. Anand was the film that made the industry sit up and take notice of Amitabh Bachchan, though Rajesh Khanna had the authour-backed role. Whereas Namak Haram was the film that made Kaka see the writing on the wall; long before anyone else saw it. Still, he did have quite a few hits in the 70s, though they didn't match his earlier successes. You're welcome, Nagesh. :) Thanks for dropping in, and for the link. I'll surely take a look. Neither are available on the 'net as yet, but I'm sure they will be, soon. I *think* I saw Baharon ke Sapne on DVD when I was in India in April. If not, I'm sure the DVD chaps will also be busy flooding the market with RK DVDs, if they haven't done so, already. Lovely tribute, Anu. Very well written indeed; and a perfect choice of films that really highlight his versatility. Thanks, Sridhar. Good to see you back here. Great tribute, Anu. Rajesh Khanna WILL be missed. His reign at the top marked an epoch. I was (am) a die-hard fan, and am so glad that you listed some of his best roles. I've just come back after a long hiatus from the Net, and see that you have so many, many wonderful posts that I have missed while I was away. Looking forward to going through each of them, and catching up. The cause of his death is baffling.Is it liver infection,or kidney failure,or cancer ? The hospital never issued a statement.If it was liver infection,how come he never went abroad for treatment ? The media should investigate further and let public know. Why? What business is it of the general public's? And isn't it a personal decision, whether to go abroad for treatment or not? Allow him some privacy, atleast in death. I am coming back about Samir's point about songs, Rajesh Khanna and Amitabh Bachchan. One important aspect is that RK created a bang with a romantic lover image, and stuck to that. AB created a sensation as an Angry Young Man, where songs would have been awkward. His biggest landmark films Zanjeer and Deewar rightly did not have any songs lip-synched by him. But AB's greatness lies in his enormous ability to straddle all genres like a colossus from AYM to romantic, brooding to comic. I hope I would not cause much uproar if I say AB is far bigger than RK. Thus he had songs of all types picturised on him which became iconic. Even songs sung by himself are now landmarks. To the extent I like post-70's songs :) I find it difficult to agree with Samir's proposition. Ngyeh. :( I am an Amitabh Bachchan fan, but honestly? AB's songs, except for the ones in his Hrishikesh Mukherjee films, and a few other exceptions weren't really great songs. They were listenable in the context of watching the film, but that is about it. As for his own songs, the ones that he has sung - well, they are popular, no doubt, but no one said popular = good. C'mon, we had this discussion over at your blog. :) We all agreed that being in the Top Ten, or in Binaca Geetmala didn't really mean they were the best songs from that era or even that film. And RK's body of songs had much more to recommend them even today. So why were you AU or AM or Anil? You aren't suffering from split personalities, are you? We want to know the nature of his illness.The press was just filling it's prime time news by showing clippings of his distraught fans.They should have gone a step ahead and done some serious investigative journalism instead of telling us things we already knew.Why were his family members hiding his illness ? In fact Akshay Kumar till few days back had said that Rk is more than fine.Why was he lying ? Even the hospital is keeping quiet.Something is fishy here.I remember when Amitabh fell sick in 1982 the entire world knew what was wrong with him.The whole secrecy surrounding RK illness is uncomfortable to me.There is something more than meets the eye. The man has been ill and in and out of hospitals for the past year and a half. As long as there was no foul play, and there is no reason to believe there is, whether he died of cancer or liver trouble, or just died is a personal matter, and no one else's business except theirs. Let's keep investigative journalism to matters where it is sorely needed. He may have been a film star, but he was also a private individual and while his fans have a right to mourn his death, they have no *right* to anything else. Not his life. Not his death. Then why did Akshay Kumar tell lies in front of the entire nation ? He owes an apology to the country.If Rajesh Khanna was ill for last 2 years,why he didn't seek treatment abroad ? I an sure he could afford it ? Isn't that his prerogative? Whether he chose to go abroad or not? It truly is none of our business. And just because they are filmstars, do they really have to tell all and sundry what ails them? It is a private matter. They kept it private. No one, and I repeat, no one, has any *right* to know about somebody's health problems - not if they are not immediate family. All i am saying is that there has been a cover up on his true illness.Else Akshay Kumar wouldn't have lied to the nation. Yes, you did, and I ran around like a chicken with its head cut off trying to figure out what was happening. I noticed that I had the problem you spoke of (not being able to see any comments) on IE, whereas Firefox was fine. I think it had / has something to do with the browsers' compatibility with Disqus.